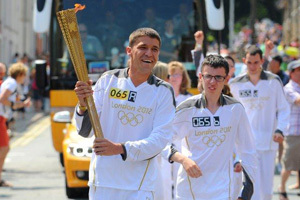 Daniel is one of 10 Special Olympics athletes chosen for the Torch Relay through the Coca-Cola Future Flames campaign. Among them is Omar Haddad, a gymnast who won five gold medals at last year’s World Summer Games in Athens. Omar is also star of an award-winning short film that illustrates how encouragement can help people with disabilities transform their lives through sport. In all, more than 60 Special Olympics athletes and coaches have been chosen as Olympic Torchbearers, including Jacqueline Minchin, a swimmer and part-time clerical assistant who is also a spokesperson for employment of people with disabilities. Coaches chosen to take part include Val Hanover, a winner of BBC’s Sports Personality of the Year “Unsung Hero Award.” She is retiring after three decades of dedicated work with Special Olympics athletes. Val is definitely leaving on a high note, especially after her victorious run with the Olympic Torch Relay. 1. What is the essence of the trail inspired by a number of athletes? 2. What was Stephanie Handojo remembered in last year’s Athens for? 3. Who nominated Stephanie for taking up the Olympic Torch and how did they motivate their choice? 4. Whom is Stephanie accompanied by on her way? What are his sports achievements? 5. Why was Daniel Bendle inspired to run? How was he succeeding in sport? 6. How many other torchbearers were chosen as torchbearers and which of them are mentioned in the article? D) Look at the pictures below. Define each kind of sport; speak about the armour, the rules of each game, the playing area, etc. Use the topical vocabulary while discussing the pictures. 1) Telling a story. Prepare a piece of information about some kind of sport or game and supply it with names of the sportspersons who represent this activity (make sure your topic differs from other students). Saturate your story thoroughly with the topical vocabulary. Tell it in the class to other students and be ready to answer their questions. IV. Exercises on Synonyms | Sharing experience.